I am surprised that they are even making them, but there are going to be 2014 Twilight calendars! Both are based on the entire cast. One is the Twilight Saga Calendar and the other is Twilight Forever. Both are wall calendars that run from January through December, 2014. The feature full-color images from the movies. The Twilight Saga calendar has a different featured character each month (including Renesmee) along with some smaller pictures of the character from the movie. 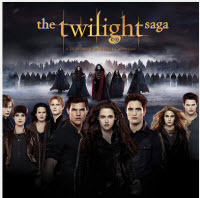 The Twilight Forever calendar has different scenes from the movie as the storyline progresses from Twilight through Breaking Dawn. A great gift idea for those still hoping for more Twilight! Plus, through Oct 23 you can use code OCTFREE to get free shipping!